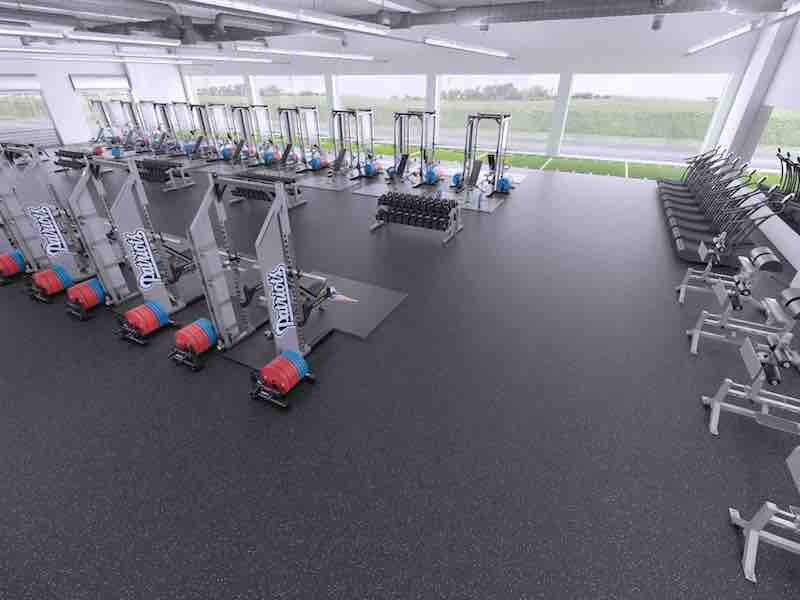 Weight Room Design | Layout a modern high school athletic weight room! 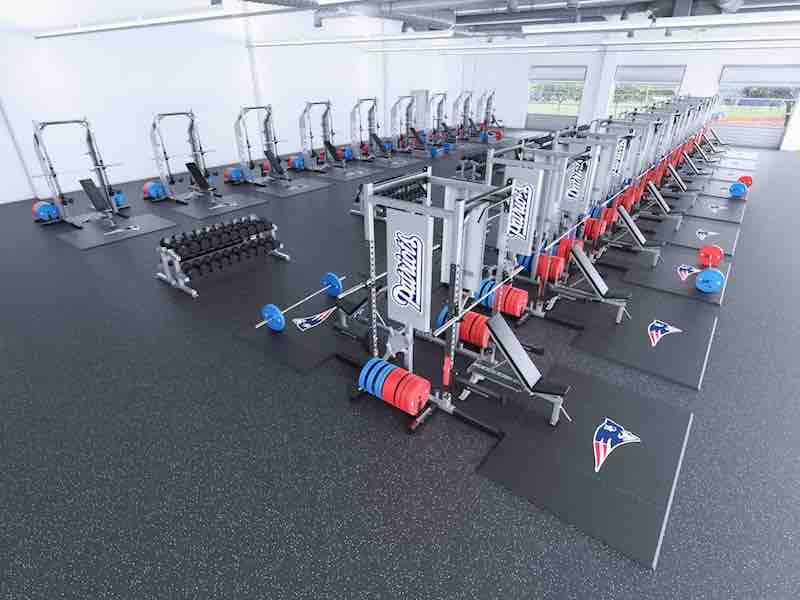 Weight room design can influence the literal perspective of student athletics with creative and trending layout features designed to deliver value, safety and performance in the weight room. Weight room design has been defined by some in our industry loosely within the scope of equipment sales. Our goal in writing this article for you is to communicate value, and cost savings, as a result of modern design and layout planned within the breadth of your facility’s purpose and function. Our communication with you, the coach, athletic director, superintendent and other stakeholders is vital. Thank you for watching our weight room design video. We value the input of strength and conditioning coaches, and performance coaches. We want you to know that we attend many of the same coach clinics and conferences that you do. I look forward to meeting you, shaking your hand, and hearing more about your story. It’s been many years since I put a uniform on. But I still get in the weight room! I look back on my days as an athlete in high school and college, as well as my time serving our country as a Marine. It is my personal pleasure and pride, to be able to work with high schools and colleges everywhere. “We’re here in Arlington, Texas, at Lamar High School with Coach Skinner. Coach, what is your biggest challenge in weight room design, when you’re considering a new, or refinished weight room? What is it that you find is the most challenging aspect? For us, definitely the layout. We provide conditioning for, not just football [athletes], but a ton of athletes [in other sports] here. So all sports [teams] use it [weight room], and so, we needed to have efficient flow. Obviously safety was a huge concern, just making sure that everything fit. You know, you guys helped us with that .. just getting the design, flow, and layout .. that gave us the efficiency that we needed, and need for our athletes. 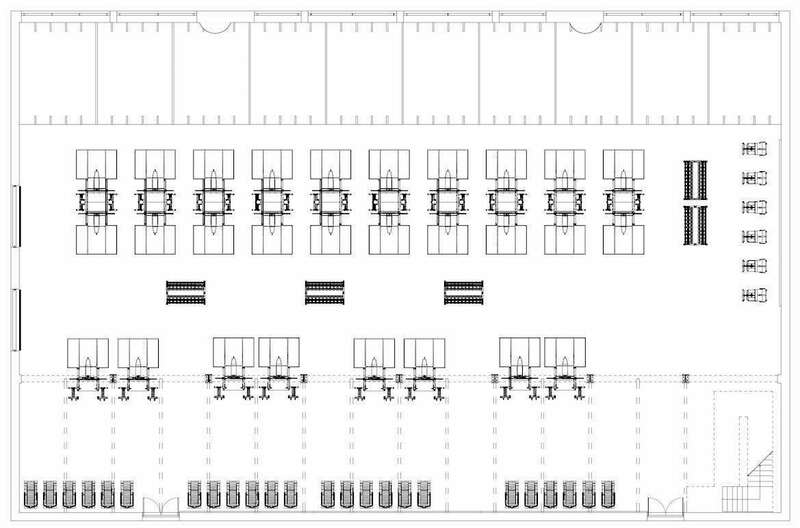 Great, you know, here we’ve got 7500 square feet, and 36 [weight lifting] platforms. We’re standing in a significant amount of space to capitalize on trending design features, and practical design features. How many athletes do you think you put through here in a day for your workout? Oh boy .. ahh, I would say that we have well over 350 athletes in here a day. Weight room design, 101 – School’s in! Learn how to modernize the layout, floor plan, form and functionality of your high school athletic weight room in 9 steps. Weight room design, huh? Isn’t design and layout the same thing? Short answer, NO. How does layout express a design strategy? Are designers services and equipment sales company design services equal? It boils down to incentive, right? Enjoy the article, and please contact us today! What is the incentive of a designer? We can’t speak for all designers. Our incentive is to communicate your vision, brand, and competitive advantage. We focus on developing the very best student athlete experience possible. We develop facilities to help coaches prepare students for safe, and winning seasons! We want happy athletic directors, coaches, student athletes and communities! What is the incentive of an equipment company dealer? Sell more equipment than the month before. Dealers offer layout and design services to sell your school more exercise equipment. We’re not saying that selling something is a bad thing — we’re all selling something, right? But, it’s fair to point out that equipment sales folks don’t actually design. They don’t create a vision of your brand, they sell equipment. Take a look at the design project below. These four images represent different stages of a real project. We were asked to develop the clients vision of the space. Do you see how the finished design was based on the original concept? Please take note of the weight room draft below. You may immediately understand practical considerations in the scaled layout draft. 2D and 3D images help stakeholders visualize design concepts from beginning to completion. Using images we are able to tell a compelling story. We create 3D photorealistic rendered images. 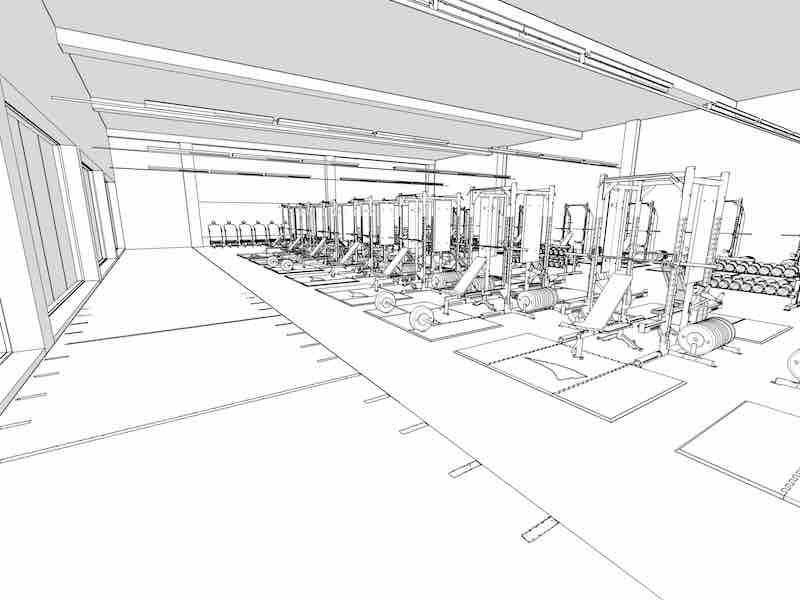 Can you visualize the design draft to the completed weight room design concept? The design images below tell a story based on purpose. We tell your story in stages before you invest $1 into the finished weight room design. We adhere to the rules of design, functionality and utility. Yes we do the sometimes not-so-fun job of working with contractor issues. And, yes, we well understand budget goals. But we draw and form ideas based on purpose. So we’re focused on strength training and performance coaching. We understand exercise science and exercise physiology. We understand the difference between strength coaching and performance coaching. And we know how to design a facility accordingly to accommodate your coaches and teams! The scale drawing starts the visualization process. This draft (scale ⅛” = 1“) illustrates equipment and indoor turf layout. Your weight room renovation project will include many images. Images help to fill in details written into the layout and space planning phase of design. Are we on the right track here? Now, in color — what do you think of the elements illustrated in the 2D & 3D images above? Can you now visualize the purpose of the layout, balance and flow? A picture is worth a thousands words, right? Images are very important. They describe, in vivid detail, your vision and they help you to tell your story. If you’re a coach, the athletic director, or even better, a student athlete .. do these strength room images scream “hustle” or not?! You may not notice some of the design features in these images above. From left to right (or top down), we designed this space to include premium products. Rubber flooring, and weight lifting platforms seat tucked away under every power rack. The lined path you see, in what looks like a sprint track, is actually indoor artificial grass (indoor turf). It’s marked with lines which extend the length of the weight room to the roll up doors leading to a parking lot. We detail many features in each image above. Note the shapes in the weight lifting platforms .. they’re high school logos! The walls host school mascots, and wall-sized sports play images. They’re displayed to motivate student athletes. We’ll go more into the school branding, and design of the walls, flooring, and platforms in another article. We mapped out a concept that would be appealing to all human senses. Sight is the perception of what is real. Beauty is in the eye of the beholder, right? Light effects both sight and perception. Lighting, including light from large windows cast a perfect blend of natural and overhead lighting. 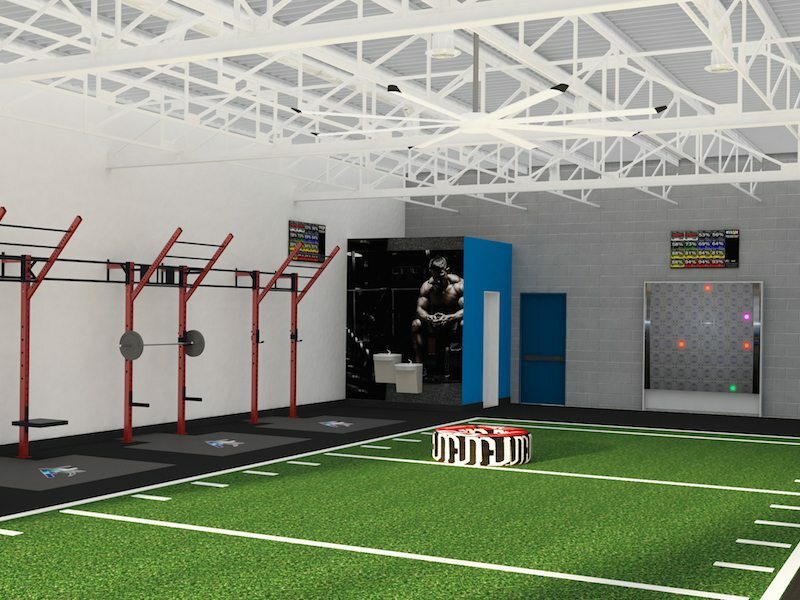 The training spaces allow for high traffic use, and team sports conditioning. Organized Olympic bumper plates, and dumbbells line up at attention. Dumbbell racks, power racks, and half racks with adjustable benches sit ready for deliberate use. And, vulcanized rubber weight lifting platforms (with logos) finish off the equipment for this weight room. It’s arranged for strength and conditioning training, and teamwork. This design represents a vision, a brand, and a serious approach to student athlete safety, and success. Coach — put us in the game! Design adds value and practical sophistication based on expectations. Proper architecture prepares your school for growth and immediate relevancy. Designing an aesthetic and well-suited weight room requires a mature understanding of purpose. The purpose of your weight room isn’t to house equipment. Coaching athletes is the purpose. The picture we paint supports humility in victory, and greatness in defeat. Hard work, work ethic, and persistence .. that’s what defines training, right? As you see in our images, the addition of design features establish direction. The intent of each feature offers motivation and transparency. You know what everything is there for — and why. Athletes play on outdoor turf, so we help them prepare on indoor turf. The turf (synthetic grass or artificial turf), and flooring features work together. Messaging and branding remain present, but unencumbered by the business end of coaching. Again, design isn’t how something looks, it’s how it looks and works. These weight lifting platforms rate 800 lb psi tensile tear resistance. The rubber weight lifting platforms serve both form and function. They’re manufactured with molded beveled edges and provide a solid foundation. We added school logos and mascots to add value to student athlete experiences. Students are proud of their tribe, as am I! What does branding have to do with design? The purpose of your architecture and layout is to share your leadership. Your purpose becomes your message. And, your message becomes your brand. Your message or story becomes marketing. What you market must equal your brand. It’s said that your brand is what other folks say about you. It’s true. That said, your job is to advocate your brand, educate students, and ensure safe coaching of your student athlete’s. This requires due diligence, practical strategic weight room layout and floor planning. Success relies on attention to deliberate engineering of your plan and relentless action. Your actions represent what you believe. People believe what you show them. People believe in how they feel about what you show them. So show them. Let your environment reflect the values of your brand! What Do You Mean, “Branding By Design”? There are 6 practical questions to think about when designing a weight room. Well, really there are hundreds of questions we consider. I thought it practical to boil down six great questions for you to think about. What is the purpose of your weight room? As I mentioned above, purpose is everything. We cannot express your brand without clearly defining the purpose of your weight room. For what are you best known? Are you best known for student safety? Perhaps you are best known for the experience your high school offers student athletes? Conditionally, these are points to consider and understand before you express your answers. Do you have weight room renovation budget challenges? Have you developed a bond package with your district? Are you competing with other departments for resources? Have all departments prioritized money marked for each area of improvement? We understand budget concerns and process. It’s better to have all budget issues aired out, and planned out. How many student athletes use the weight room daily? The number of students currently using your facility tells us a lot about design parameters, and equipment needs. This information also proves valuable in our efforts to design a moderrn, and scalable weight room. What are the facility performance needs of your student athletes? All sports teams require training and practice. That said, design and layout of equipment relies on the level of strength & conditioning or sports performance coaching offered by your school. The facility must be designed to meet the practical performance needs of your coaches, and student athletes. Is layout and design a priority for your high school? Having read the information above, you might now have a deeper appreciation for how the design of your weight room or strength room translates into the expression of your brand. Of course, timing is everything. Modernization of your athletic weight room facility must be a priority. Is your strength room or weight room prepared for growth? Our design strategy begins with an understanding of guidelines. These guidelines help us form a plan. The plan becomes our design model. We render models into 3D renderings. Our visual renditions require support of the head coach or athletic director. Often the assistant coach, strength coach, and other influencers offer key insight. Key considerations include funding opportunities and limitations, and your vision for growth. As your team grows, and the school grows, the weight room must accommodate flow. No cutting corners here. The future is now, this is where we win or lose the game. In planning. We measure specific deliverables. You measure student athletic experiences. We design through the eyes of coaches, directors and staff, student athletes, key sponsors, and — parents. Our education clients share budget, safety and liability concerns with us. 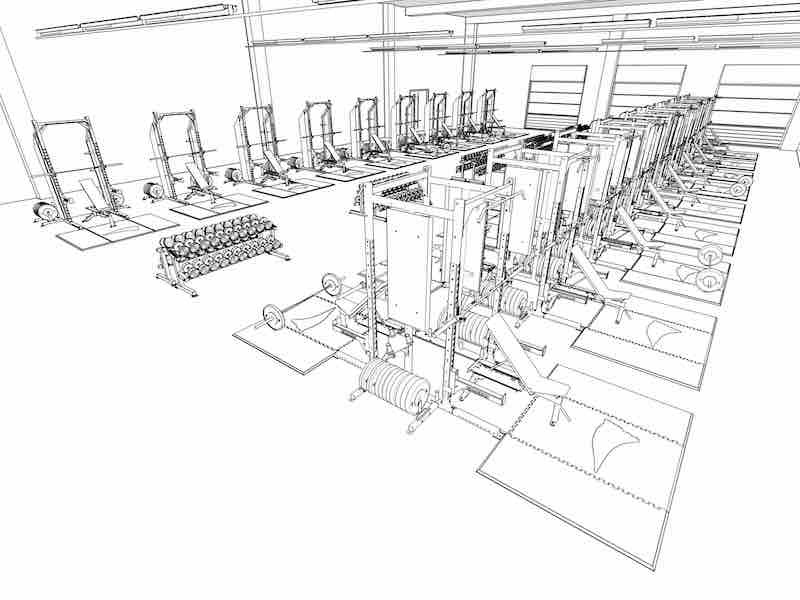 These factors can present challenges when planning a new weight room design. Funding is key. That’s why messaging is key. And, that’s why we value your branding. Your weight room design funding comes from an established budget. Boosters, parents, revenue and grants fill your budget. You’ve got to keep everyone in the loop, right? 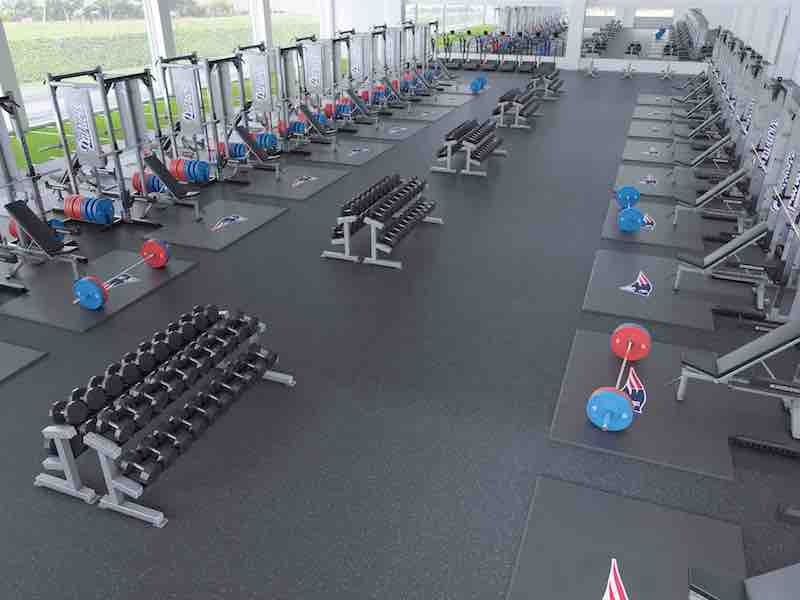 There are basic rules for relevant strength room and weight room design. Rule number one — under-capitalization equals the death of a project. We understand the diversity of your responsibilities and job. We understand the big picture. To tie a bow on this thought, we’ve connected these dots many times. This is one example of how our design services measure up against a salesman’s service. We know that if we don’t exploit a strategy for increasing revenue, the job is dead in the water before it started. We can’t develop a weight room design worthy of your brand if we don’t understand how the cogs and wheels turn. That said, we do. How to Bring Ideas to Life? I’m glad you’re still with me! These key weight room project stages include, but are not limited to the following bullet points. When your new high school weight room or college strength room is under new construction there is much to think about. We will cover a modified version of this article to help explain key elements with existing construction, renovation and weight room modernization, without areas covered for new construction. 1. Pre-planning – committee establishment for advice and guidance, goal and budget setting, and communication of your school’s vision. You want to think of this as your creative session, where you get your creative juices flowing and collaborate with those on your staff and within your team or colleagues. 2. Program design and planning – organization of space needed to perform specific activities, number of student athletes to service in your new space and any present spacial limitations. Directors should identify a project leader, and a designer who will manage the weight room design project. TIP: Overestimate the value of the planning phase by at least 10%. It is a luxury you will not have a choice to repeat without wasted resources. This is a critical phase of your new weight room or weight room refurbishment. Imagine yourself going on a trip in the car without your navigation. Most people need a physical road map. Planning is a road map. Planning will allow you the courtesy of changing your mind before leveraging the first invested dollar. Without proper planning you may have a very frustrating trip to your destination. It could be an expensive trip to your vision in which the cost of precious time and spent resources prove problematic. 3. Layout and space planning – this is one of the fun stages of your school’s project. You will use the information from the planning or program design stage to map out the space needed for each key area of your weight room or strength room. 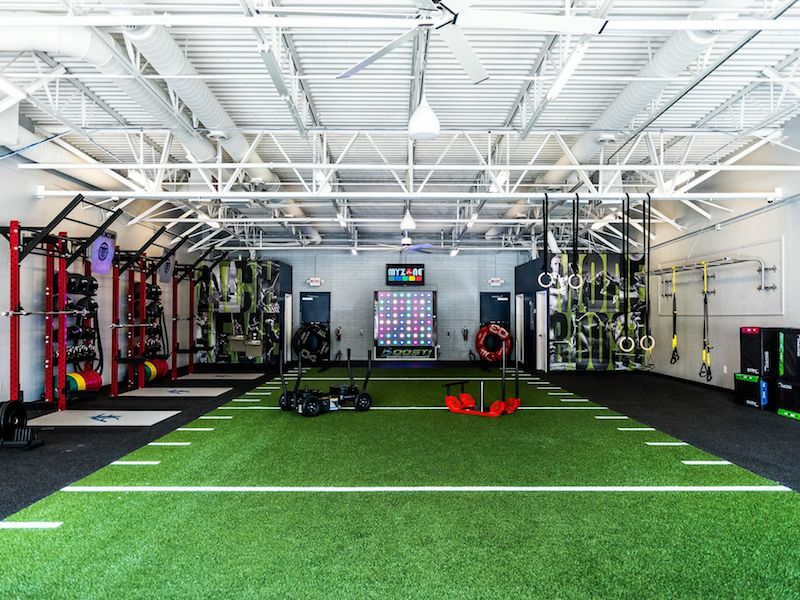 Your designer has extensive experience in space planning, and strength room or weight room design. Your designer will coordinate your budget expectations to provide a design that delivers effective use of your space. Maximizing space is critical to ensure you stay on budget and achieve goals set in pre-planning. I say this is one of the fun stages because it allows you to see your space for your room coming life with the layout. You get to start imagining how your equipment choices will fit into your space. Imagine the variety of equipment choices with focus on your brand, and your vision for the student athlete experience. These choices factor into the layout and design of your weight room. Meaning, either your budget grows or your space available. The demand on your facility grows with more athletes and teams using this space. Safety and liability, program growth, and competitive advantages provide competitive metrics. These metrics measure meaningful trends, performance, and relevance. Student athletic performance training trends show that weight room facilities use all rubber platforms to follow safer guidelines. Past trends show inserts within rubber flooring. Relevant trends show beveled platform installations above the floor, and all rubber platforms. Using above the floor platforms is a new standard in weight room design. Program flexibility, branding, volume of use, and student safety are all equal considerations that allows facility design and layout to change as your needs change. Inserted platforms within the floor, are not movable, which locks you into a binary design. We say, “be locked into nothing — prepare for growth, and maintain flexibility.” Layout, and spatial planning isn’t a position taken for appearance alone. The most important position in design is practical working functionality. 4. Creative design – this stage is where the space planner and designer adds color, and perspective with design. These elements include, but not limited to, windows and doors, ceiling treatments, lighting, flooring selection and colors, wall textures, and all things associated with the physical aspect of your weight room renovation. Leverage all your natural senses will to build a complete, and compelling facility. What you see, smell, hear, feel, and even taste will have a genuine impact on all people using your new weight room. The experience must translate and support your mission and brand. Lighting is such a strong element in design, that it warrants a complete article if not more to do it justice. Balanced lighting provides warmth, color, depth, in accents texture. You can warm up a room, or cool off. You can highlight equipment, or accent spaces of distinction. Creative lighting can drive traffic into certain areas of your weight room. Natural lighting influences human physiology and behavior. Yet, many of you already have lighting space that you will be using for this design phase. It will be hard for you to make changes for natural lighting due to budget constraints. That said, you will have to rely on other elements to make up for lighting shortfalls. 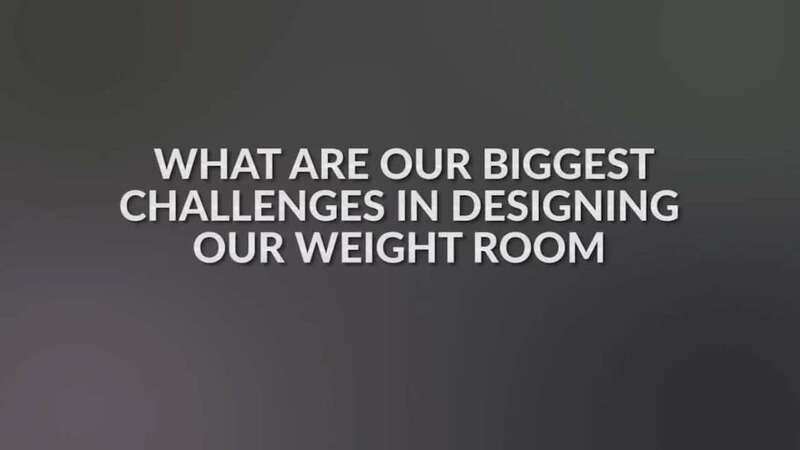 A professional designer experienced in weight room design can help you navigate these challenges. An important point to cover in the creative stage is the opportunity to create photorealistic 3D images of your proposed space. These images give the viewer a real perspective of the design. 3D images show the new facility after planning, construction and equipment selection and placement is complete — before investment. They serve to share team logos and mascots for branding and image building to use with finance requests. Create emotional connections with 3D, photorealistic high value images. These images move the ball further ahead with prospective financial stakeholders. Okay, okay, I’ll land the plane. Please take note of the images above. Do you feel great images tell a story? Can you see how the weight room design comes to life in the images above? Within the creative design phase as mentioned above, you will have the opportunity to add character, color, textures and lighting. This is how we personalize your space to your school directors, and those who a call it home. There are many important aspects of the creative design phase. Summarizing it in this article is quite difficult. 5. Construction documents – an important stage where an architect will take the CAD (computer aided drawing) files containing the creative design, floor plan and all details provided by your space planner/designer. These CAD files include blueprints with all required specifications. This is the blueprint of the actual design and construction concept. This includes any demolition of current structures. Walls, doors and other elements might need removal before construction. These factors complete the blueprint. 6. Bidding – following the approval of all construction documents, contractors receive a packet of all relative information for bidding. This packet includes the architectural drawings, 3D renderings or photorealistic images. 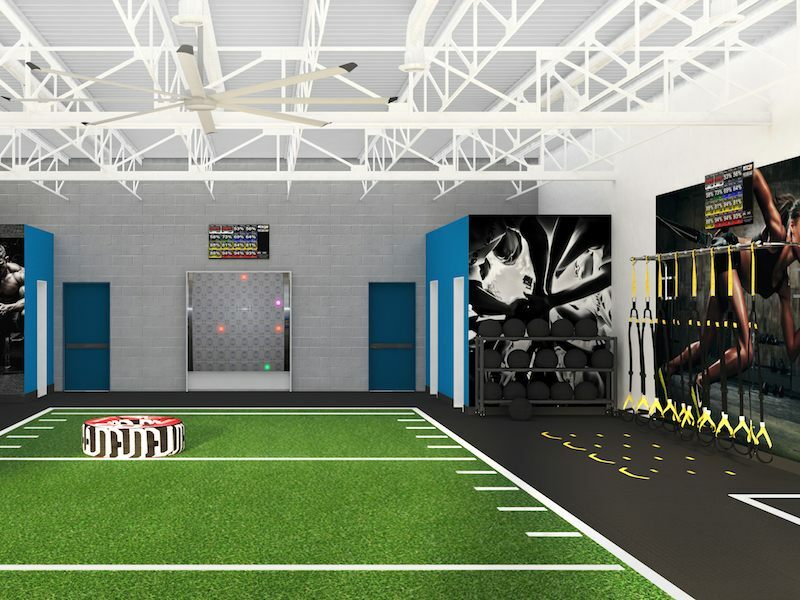 3D renderings of the proposed weight room and it’s supportive spaces, and relative specifications illustrate a complete project. You provide relative information to the General Contractor, also known as the GC. The GC will review and tender a bid for the proposed construction, with a projected timeline. 7. 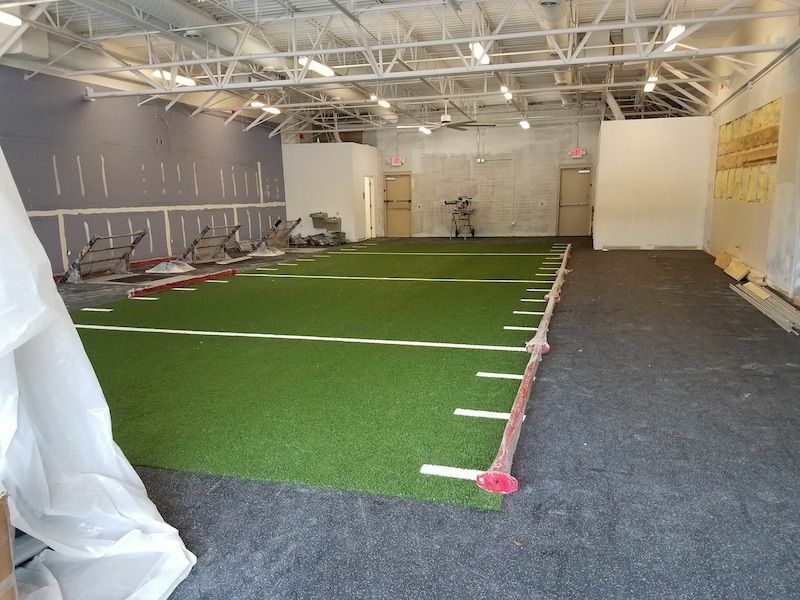 Construction – this is somewhat obvious as this is where the approved GC begins their work and the completion of your new dream strength room or weight room. You have a “last chance” to make final changes to your new space before completion of the design project. Each change at this point will permit extra charges by the GC, with the inclusion of the architect and approval of any changes. You then approve cost approval if there are any. Even without more labor and material costs, you could incur a change fee from the GC and architect, which is usually a line item written into your contract. I have seen a great deal of money saved in this phase away from design. Keeping a keen sense of cost will prove to be a major saving factor in your construction document review. I have seen thousands of dollars spent on one kind of light bulb for a light fixture, where an acceptable alternate proves viable. These types of extra costs add up. This same light fixture, also required a combination light bulb and capacitor that did not allow the replacement of the bulb alone. The mistake resulted in an enormous amount of overspend for maintenance. 8. Equipment selection and sale – you and your staff have the opportunity to choose the equipment that best fits your student athlete’s needs as well as the facilitator of the weight room. Ordering equipment, furnishings and other items for the new facility with the construction timeline kept in mind proves vital. Scheduling the delivery and assembly of this equipment is important so that you do not limit the progress from either the construction or the equipment installer’s perspective. Timing, and time management is important in this stage of the design project. TIP: Equipment purchase decisions tend to be binary based on budget, experiences and pricing. Influencers may have experiences with a specific equipment brand or dealer.If it sounds too good to be true, it is. A low price in one area may reveal high pricing in other areas. As a designer with 25 years of experience, I’ve worked with almost every brand in the business. I understand manufacturing, and dealer infrastructure, pricing, and pitfalls. A professional designer can open your field of view to relevant value drivers. Remember, a designer’s incentive isn’t to sell equipment. If it is – you’ve got an equipment salesperson, not a designer. This tip is not so obvious to influencers or key players in the equipment buying process. 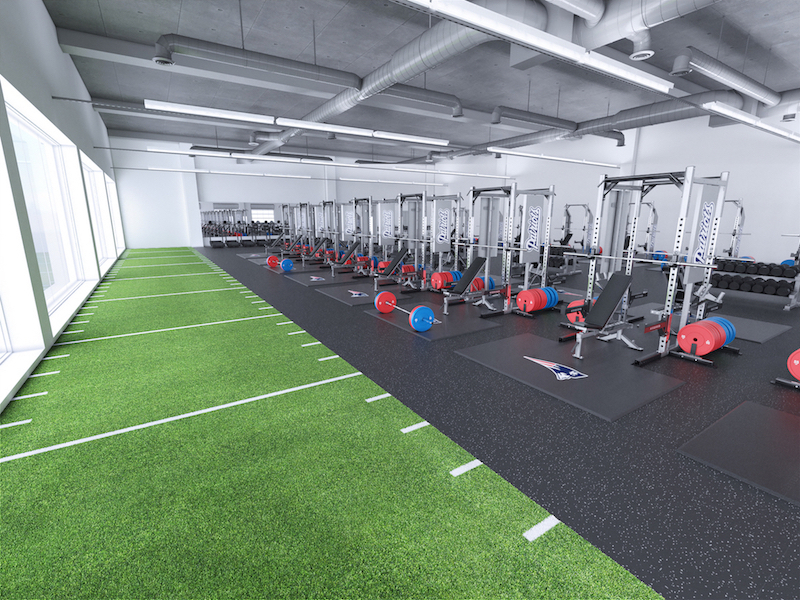 Flooring selection is critical to your weight room design, but doesn’t fall in the equipment budget. This said, flooring is “equipment” even though often assigned to the capital budget for construction. Flooring grouped in the capital category usually makes the decision maker unqualified to make decisions for flooring within your weight room. This is because flooring serves as a critical element to the active safety of student athletes. Imagine building a medical clinic and the person in charge of selecting sensitive medical equipment was a person most experienced in roofing materials. There would be exceptional deficiency in decision making related patient safety, and liability to the medical clinic. Imagine your school making a similar mistake — because your coaching staff manages student athlete safety. Highlighted in this equivalent example is the fact that your students come into contact with the flooring — not your roof. Student safety and liability to the school remains a chief concern in your weight room every time students use it for strength training, plyometrics, stretching, agility, and several other athletic training exercise modalities. It is critical that you take advantage of the technical sports flooring advised by your designer (me) offered in today’s market. This type of extended knowledge and experience pays off on the front-end by trusting the expertise of a focused career athletic fieldhouse, strength room and weight room designer. 9. Construction and equipment installation complete – you did it! 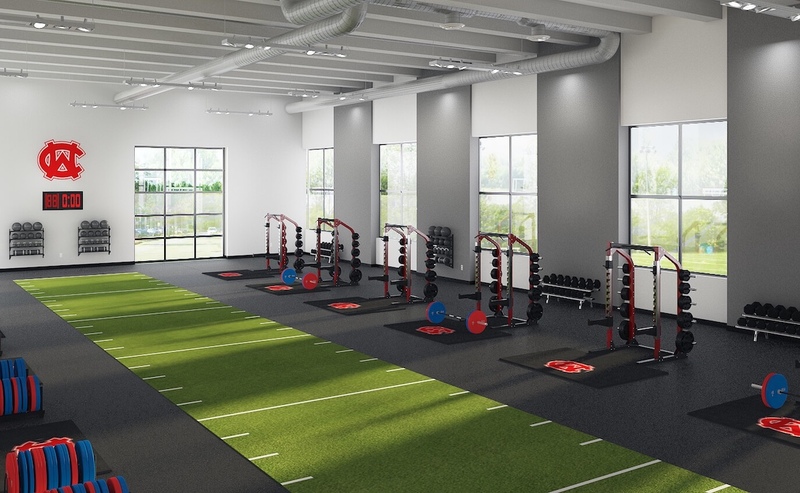 Students athletes now have a modern weight room designed for safety and performance. It’s what you have been waiting for, and now it’s finally here. It is time to enjoy the fruits of your labor. Students and coaches will gather here, and raise the roar of victory. You’ll listen to the clanking of weights, and grunts of teammates training together. Coaches are standing a little taller, and moving a little faster. You’ve earned the news press and accolades you’re receiving. Together, we announced a stunning weight room design. There’s a new smell in the air. Mildew gave way it’s odor, in defeat of ambitious days to come. New student recruits will tour your facility with wide eyes. Yes we painted the picture. But we painted your picture.We will have completed your new weight room design project with pride. This project wrapped up on time — on budget. Your mission, vision and focus on student athlete safety shines. Your facility will now set new standards in a competitive field of student athletics. The brand, your leadership, and vision motivate other students to join your ranks. This project endorsed a quintessential surge in team spirit and revenue growth. We’ve designed your weight room to define your purpose. Contact us to discuss your weight room design and facility renovation plan. Are you responsible for the renovation of your high school weight room or college strength room? We look forward to helping you develop a weight room design worthy of your vision, student body, and brand.